The internet has made the world a much smaller place, and the launch of the Periscope app last year took it a step further. The app is partly responsible for bringing live video streaming to the mainstream. This allows users to broadcast video around the world in real-time. A lot of the content that shows up on Periscope is relatively useless. For example, bored users hanging out in their living rooms and taking random questions from viewers. And yet, the technological capabilities the app provides give plenty of options to business owners. They can connect live with customers and clients no matter where in the world each party might be. Here are six ways businesses can use Periscope to grow, maintain and interact with their customer and client bases. Businesses looking to use Periscope to augment their strategies can do so in a variety of ways, but no matter what, they should first plan ahead. Think of Periscope as another form of content distribution to go along with your website and social platforms. It always helps to prepare a content calendar when using any of those other channels. The same rule applies when using Facebook to connect with customers and clients. A content calendar gives potential viewers an opportunity to plan for your videos. For example, if you start promoting a Friday afternoon Periscope broadcast on Monday, you’re likely to bring in more viewers than you would if you just spontaneously start broadcasting on Friday. Another key part to the planning process is promotion. Be sure you promote your broadcasts across all your social platforms. Also, be sure to promote upcoming broadcasts to those who subscribe to any email newsletters you might distribute. As is the case with any type of promotion, you don’t want to go so far as to potentially annoy or offend potential viewers. But, you do want to keep them aware of your upcoming broadcasts. One of the great things about Periscope is that it can bring people from all corners of the world together without them each having to travel. And large audiences are a perfect opportunity for businesses to show off their products. Product demonstrations on Periscope could unfold in a few different ways. If it’s a brand-new product that’s about to be released, viewers will mainly be interested in being among the first to see the product in action. Use the “advanced look” opportunity as a selling point in getting viewers to log on during your demonstration. Demonstrations of new or forthcoming products are great. Yet, the method can also be used for products that have already been on the market for some time. One of the best ways to do so is to highlight hidden or little-known features of your product. For example, if the product is something relatively mundane, such as canned corn, the uses are pretty much straightforward. Most people simply heat the corn and serve it as a side dish with dinner. But in your Periscope broadcast, you could teach viewers new and unique ways to use that same corn. Feature roasting it and putting it on homemade pizza, or using it for a corn-based salsa. Whether you’re unveiling a completely new product or helping an existing one, the key to product demonstrations is teaching your viewers something new. You can also directly answer questions from viewers in real-time. In this age of constantly updated information, many people suffer from FOMO — the fear of missing out. Your customers and clients won’t ever have to miss out on your product launch events. Even if they can’t physically be there, you can broadcast it on Periscope and be accessible. This strategy can work for a variety of new products, including new car models, video games, the latest basketball shoes, fashion and apparel, musical albums or even home appliances. Whatever the product is, don’t forget to include a call to action. Give your viewers an outlet — whether it’s a website or a physical retail location — where they can learn more about the product. And perhaps even try it out for themselves. Because of the visual nature of Periscope, it’s naturally a good fit for businesses with physical products to show off. But audio is also a key component to the app, making it a strong tool for holding question-answer sessions with your global customer or client base. Periscope’s chat feature allows viewers to text comments and questions to the broadcaster. This creates a true one-on-one experience. Customers and clients always like to feel as if their needs and concerns are addressed directly. A Periscope Q&A gives businesses a chance to do so. This could include questions about a physical product, but the method can also be used for more service-oriented businesses. For example, a local real estate agent could promote a Periscope Q&A in which she’ll take all manner of questions. Perhaps touching on the local home buying market, changes in property taxes and high-demand neighborhoods. In a perfect world, businesses wouldn’t have to worry about crisis control. But the fact is that issues sometimes arise that get customers or clients worked up. A Periscope Q&A is an excellent opportunity for a business to address any questions or concerns directly. The broadcast can also be saved and linked to for other concerned clients that may not be available to tune in live. Periscope allows business owners to give their customers a look at day-to-day operations. It can help humanize the brand and increase affinity levels. Just think about it: if two competing brands offer similar products, but only one of them shares its inner workings with customers on a regular basis, which one are you more likely to use? Read next: What Is Content Maturity Model and How to Get to the Next Level? 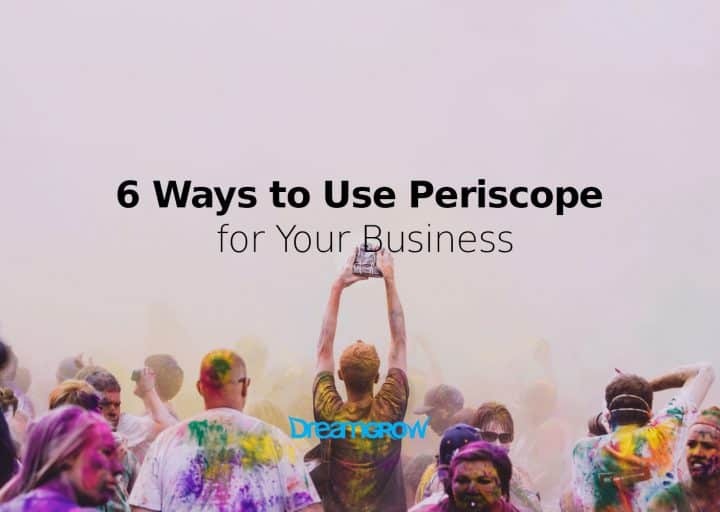 Giving Periscope viewers behind-the-scenes access can work for any type of business. But it can really help build fans for businesses in the entertainment industries. For example, a TV network could give Periscope viewers a truly behind-the-camera experience while shooting a scene or segment for a TV show. Or a music label or artist could take viewers into the studio with them, showing the ins and outs of recording or mixing a track. When it comes to humanizing your business through Periscope, it’s not as much about generating new fans or customers. It’s about engaging with your existing fans or customers. For example, if the New York Yankees gave Periscope viewers inside access to the team’s clubhouse or dugout, it’s not going to convert Red Sox fans. But it will make existing Yankees fans feel that much closer to the team. Humanizing your business on Periscope is about building brand loyalty and affinity. Celebrity appearances are always a sure way to generate crowds at live events, and that’s no different on Periscope. The advantage of using celebrities is tapping into that star’s existing fan base, with the hope of adding more customers or fans of your own. An endorsement or appearance by a celebrity can certainly be costly. When done correctly, that cost will result in new business. The level of celebrity you get will likely depend on the size of your business. Not surprisingly, it will be much easier for national brands or businesses to attract A-list talent to their Periscope broadcasts. Still, there is plenty to be said for using celebrities on a local level. Local sports stars, newscasters and radio personalities all have fan bases in their given cities. Local businesses can leverage those audiences with a Periscope broadcast in which the personality interacts with fans while also touting your business. Before using any of these Periscope methods for your business, be sure the proper planning is in place first. Then, no matter which method you use, make your content interesting, engaging and generally fun to watch. Make it the type of broadcast that will keep viewers talking (for the right reasons), and use that momentum to add new customers. BIO: Lexie Lu is a designer and blogger. She actively contributes to the design world and usually has a cup of coffee in close proximity. She writes weekly on Design Roast and can be followed on Twitter @lexieludesigner.